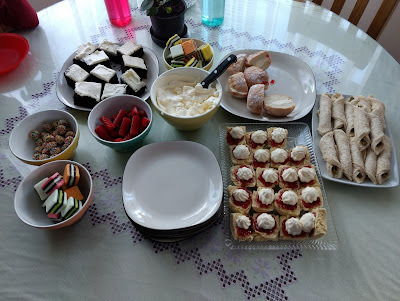 "It's just over the one year since Dad passed & I have yet to write about it or put a poem together - but that is ok. We acknowledged it on the day with family, & shared an afternoon tea at our place full of everything he loved. We went through the slideshow & the funeral, & listened to a couple of the funeral songs - it was lovely but still a bit surreal. Seeing those photos of him again, made it feel like he was still right here with us & I can't describe it. It was a very weird feeling really, but nice - I didn't cry this time, it wasn't that empty feeling anymore." I have noticed though, that as time has gone on I don't 'hear' you as much; in the first few months I used to 'hear' you talk to me in my head - in your voice, as I was going about my life... little things you used to say, silly comments that would either make me smile or shed a tear (depending on my mood that day), things I would have expected you to say in regards to something that had happened (like Lydia completeing the tryathlon on your anniversary, you would have been so proud). Now I have to really think hard to hear your voice, but as soon as I hear it on a video it all comes rushing back to me. It still surprises me that you're not here some days, other times it feels like you have been gone forever... But I still find myself crying unexpectedly over a memory that was triggered suddenly, the least little thing can still 'get' me, but it's becoming less and less. I know it's time to let go and move on; I know you would want that too - but some days I just can't. I did manage to throw together a poem to commemorate your first year away from us; not my best work, but the feelings were still deep. I am grateful that time can dim the pain a little bit; it never goes, but you learn to live life again; a new reality with each day. This is a little clip Google put together at Mum and Dad's 40th wedding anniversary... I love how they take a quick glance at each other, and it ends with them both having big smiles for the cameras. 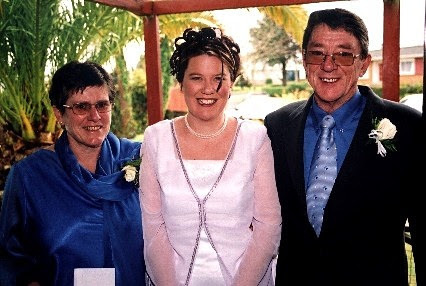 I love this photo of me with Mum and Dad - he was so proud to be walking me down the aisle, despite being so sick that day that he should have been in the hospital; nothing would have stopped him being there for me. Mum and Dad in their element; all the young Grandies together at their house... in almost all the photos I have of Dad with my kids, he is gazing at them adoringly, like he was here. It is such a special memory, knowing how much he loved them; I only wish they were a little bit older before he passed away. Thank you Dad for almost 42 years of devoted love and complete acceptance; I can never repay you, nor ever forget.